We only had one bully at primary school and he wasn’t very good at it. Although I was never directly affected I was vaguely aware of where he was in the schoolyard and when he got close I kept my head down. What I was aware of was the circle of yelling school kids on the oval after school that formed as the bully tussled (not always successfully) with his latest victim. I was reminded of this last week when I observed a circle of a dozen Australian Magpies (Cracticus tibicen) carolling loudly around two birds having a rough and tumble (pictured left). A search of the web to explain such behaviour revealed that this is not an uncommon occurrence in magpies with many explanations given for such behaviour – a territorial dispute between flocks, determining the pecking order within a flock or a battle for food or even breeding rights. Dust ups between birds I am used to seeing (see Wattlebird Wars). They are usually over and done with in a flash. 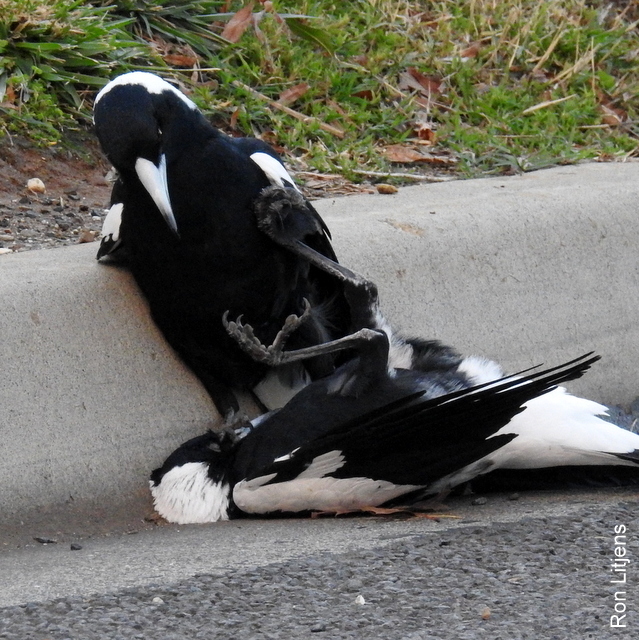 However in this case the dominant magpie in the fight held the other magpie down for several minutes occasionally delivering a peck or two to the prostrate victim which just laid there (pictured right). The carolling onlookers also added a peck or two for good measure. What disturbed me about the whole proceeding was that it somehow looked vaguely – human! A bird of a different colour? A newcomer. 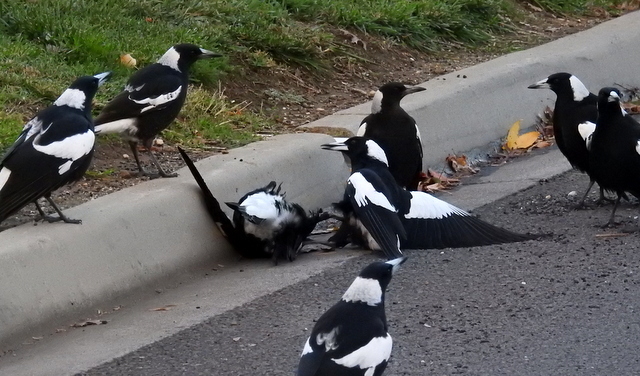 This is a Magpie law court. Ravens do it too. Depending on the outcome the offending bird will be chastised, as it would appear in this case, ostracised from the flock, i.e. banished, or killed. That’s why the one being attacked was so passive. It was accepting the sentence being metered out.